The protest, held under the banner of Dalit Shoshan Mukti Manch, highlighted rising atrocities against the community and pledged to oust the BJP government at the Centre. 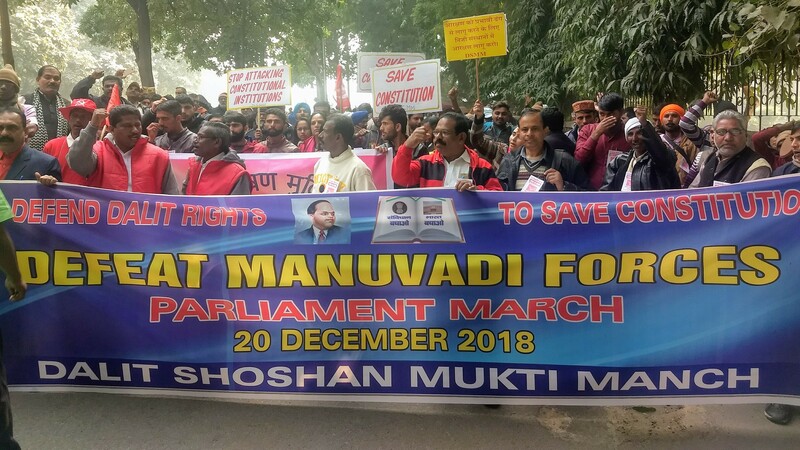 NEW DELHI: In the heart of Lutyens Delhi, Marching from Mandi House to Parliament Street hundreds of activists, scholars and members of the Dalit community sounded the poll bugle demanding the defeat of Manuvaadi forces and the BJP government. Even as 90 years have passed since the regressive Manusmriti was first downed by Babasaheb Ambedkar, violence against the community has gripped India. According to the National Crime Records Bureau (NCRB), a total of 40,774 cases were registered in the year 2016 under the Scheduled Castes and Scheduled Tribes (Prevention of Atrocities) Act and other sections of law over alleged crimes against SCs and STs. The conviction rate in cases of alleged crimes against STs, the conviction rate was 20.8 per cent, and in case of SCs, the conviction rate was 27.2%. Ramchandra Dome, general secretary of Dalit Shoshan Mukti Manch, which organisaed the march, said, “The march is in protest of the casteist and communal oppression faced by Dalits all over India.” In recent times, especially the last four-and- a-half years of the Narednra Modi government, the atrocities and oppression faced by the Dalits have seen a steep rise. The DSMM march saw participation from across the country, including Kerala, Himachal Pradesh, Tripura, Bengal, Maharashtra, Tamil Nadu. The protestors demanded that the alleged false cases that had been registered against the protesters who participated in the country-wide protests on April 2, 2018, be taken back. Madurai is a city with historic importance in Tamil Nadu. It is also the fourth largest city after Chennai, Coimbatore and Trichy.